Discussion in 'Jigs & Holders' started by John Noon, Mar 14, 2019. Making an ULU that has no straight edges and tricky to keep knuckles away from the grinders belt gets interesting. 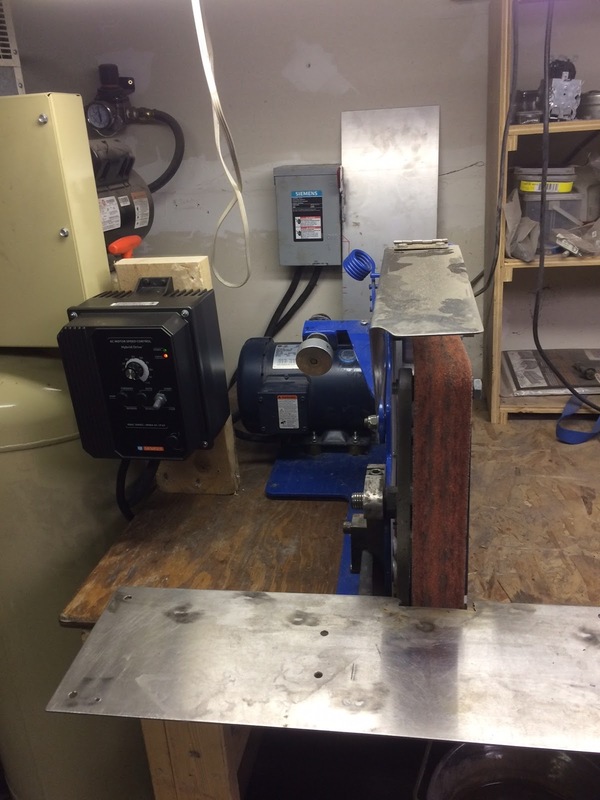 Plan on making several knives and decided time for a rebuild on the grinder. with recycled stainless work rest. In order to get full range of the joint I had to taper the nuts used for centering the holder. That's pretty smart using a ball joint like that. Great idea. @Kevin Cox showed me a longer arm version something like this once that he uses for setting the cutting edge on his blades. Decided to add another holder on the arm for grinding straight edges for both the flat platen and contact wheel. Using a early 1900’s patent for inspiration and the back of blade will run on the outer race of a bearing. The ulu jig appears to offer the freedom of hand grinding with stability of a jig. Will know for sure once I start grinding steel. Great idea. Do you have a model # or size for that heim joint? the straight blade with curved edge is a ice auger blade. They have to be angles and offset so that when sharpening or grinding you get a matching sweep. Had to make repairs on a very old leather knife plus make one for myself. A whole bunch of pictures for the random stuff I had and how it works. Feel free to share with other knife makers. PS - why kind of grinder is that? Looks fairly customized. The grinder is old and not common plus parts are very pricey. I got it used with no tool rest or anything so I have been building as needed.